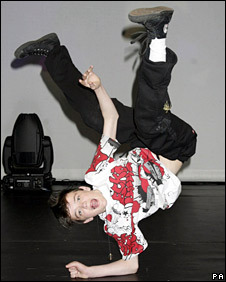 Teenager George Sampson was crowned winner of ITV talent show Britain's Got Talent on Saturday night after dancing in front of a TV audience of 13.1 million. He wowed both the studio and television audience by dancing - under on-stage rain - to Gene Kelly hit Singin' In The Rain, remixed by dance outfit Mint Royale. The 14-year-old, from Warrington, won £100,000 as well as the opportunity to perform at the Royal Variety Performance in December. Taking a break from rehearsals for the Britain's Got Talent live tour, Sampson talks about going back to school, singing exams and meeting Prince Charles. What do your friends make of your success? I went back to school yesterday and everybody just went mental over it. I just had a great time and it was good to see the people I knew before the show. Who are your inspirations when it comes to dancing? Justin Timberlake, Chris Brown, Usher - big acts that do the dancing as well. Can you tell us about reports that you have a back problem? I have a spine disease called Scheuermann's disease and it's a curve of the spine and I was diagnosed with that last year. I have to go to the doctor's every year for tests. It's not going to stop me dancing - I'm fine about it. It's just when it hurts - don't dance. How will you spend your prize money? I'm gonna pay my mum's mortgage of 50 grand - she doesn't want me to but I am. And go to LA and buy a Volkswagen camper van. I won't be able to drive it for three or four years but I'm going to get it anyway - my mum'll drive it for me. What will you say to Prince Charles when you meet him at the Royal Variety Performance? I honestly think I'll be blank and I'll just kind of go with the flow. Who was your favourite judge and why? At the start of the show, it was Simon - probably because he's the biggest name. Now I'd say Amanda because she seemed the most happy I'd won. Have you spoken to Simon since the final? I have and he said he's coming next week to decide what's gonna happen from now on and I can't wait. But I don't know what's going to happen. You had a singing exam on Monday. Is your singing as good as your dancing? My mum thinks it is but I'm just nervous singing. I've got more confidence dancing. Would you like to release a record? Ooh, I dunno. I've not really had a deep think about but, in the future, maybe. It looks like Singin' In The Rain could be number one on Sunday because you used it in your winning routine. How does that feel? It's unbelievable - it's great to help out. The guys that made the mix messaged me on My Space saying 'hi' so it's just incredible. Why did you choose the song? It's a commercial song, something that everyone will know. It's a huge hit remix which is on the adverts at the moment so why not? Was it tiring dancing in the rain that came on the stage as part of your performance? The rain comes down so fast and it's really warm so it's really tiring and hard. But when you've got that much adrenalin it doesn't matter. You looked shell-shocked at the end of the performance. How did you feel? Just stunned that I'd been able to do that performance in front of so many people. And cold. It's like a shower when you come out - very cold. It was unbelievable - I felt so cold. If you had a message for young people who wanted to make the most of their talent, what would you say? Don't let anybody get in the way - if you stay strong and determined, it'll pay off so just keep your head down and focus on it. With me, I wanted it more - it's just determination. 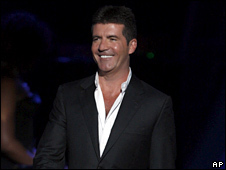 The Britain's Got Talent live tour starts on Friday at London's Hammersmith Apollo. 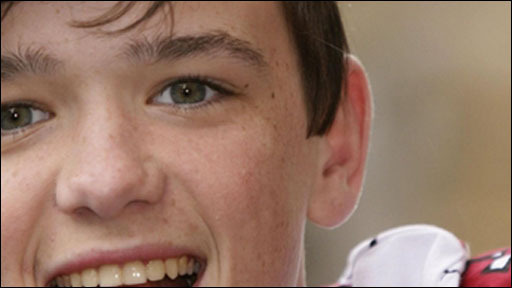 George Sampson was talking to BBC News entertainment reporter Liam Allen.